11 Febbraio 2019 – W.A.P. Among the long list of Lighthouses that will be activated during the weekend from 15th through 17th Febr. 2019, three of them will be particularly interesting from the Antarctic chasers as they are located in the Peri-Antarctic areas included on the WAP-W ACA and on the WAP-LH Directory. 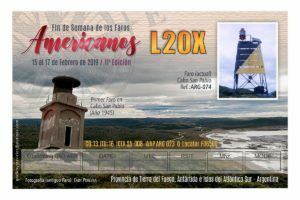 Hams from Tierra del Fuego will be on the air activating the two Lighthouses at Cabo San Pablo, 115.8 km from the city of Ushuaia, in the department of Rio Grande, second city of Tierra del Fuego, Antarctica and the South Atlantic Islands (Argentina). The lighthouse are located on the Cape of the same name, on an isolated mountain, very characteristic for its rounded shape that protrudes from the coastline. Its construction began on March 15, 1945, and during the month of December 1949 there was a seismic movement that caused a dangerous inclination of the tower, a situation that forced the removal of the luminous equipment and deactivated the signal. The building, still remains onsite and it will be activated for the first time in its history. 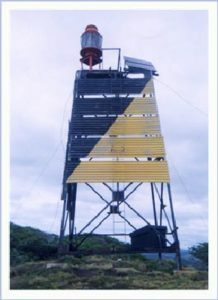 In 1966 the reconstruction of the Lighthouse has been ordered and currently, the lighthouse is on a yellow pyramidal trunk tower 6 meters high, with a black triangle with its vertex down. It also has a platform in the upper part to house the luminous lantern powered by photovoltaic solar energy, which gives it an optical range of 12.5 nautical miles. 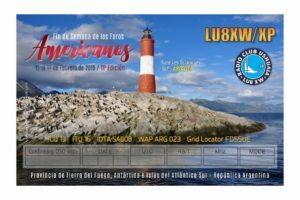 Both Lighthouses (Grid Locator: FD65OQ) will be on the air the same day and in different bands and schedule in FT8 and SSB. Located in the Beagle Channel marking the approach to Ushuaia, the lighthouse guarding the sea entrance to Ushuaia, is still in operation, since it was put into service on December 23, 1920. It is remote-controlled, automated, uninhabited and is not open to the public. Electricity is supplied by solar-panels. 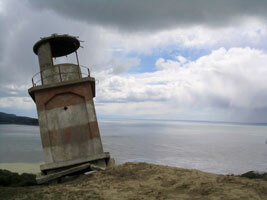 The lighthouse is a popular tourist attraction, reached on short boat tours from Ushuaia. It is known to the Argentines as the Lighthouse at the End of the World (Faro del fin del mundo), although that name is misleading. Les Eclaireurs lighthouse is often confused with the San Juan de Salvamento lighthouse on the east coast of the remote Isla de los Estados, that earned that nickname made famous by Jules Verne in the novel The Lighthouse at the end of the World, which is really much further east.